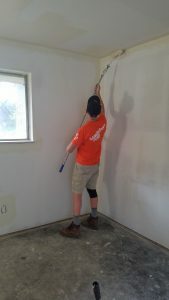 Team Carl continued their work on finishing up Adrienne’s home with paint and other final touches. 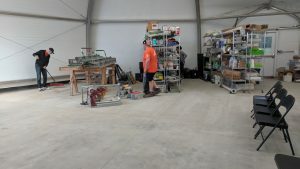 They had hoped to finish the house this week, but both of our teams will be working cleanup at basecamp tomorrow. They said farewell to Adrienne, John and their grandson this afternoon before wrapping up for the day. 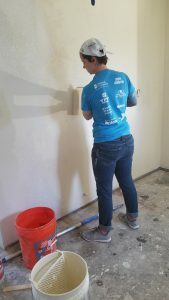 Team Carla was able to get a primer coat of paint on a majority of the house they had been working on earlier in the week. 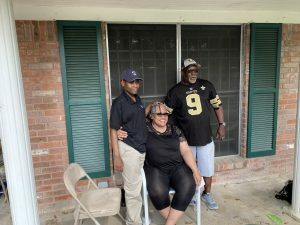 They were also able to meet Shun and her son, Courtney, who were at the house all day working alongside the team. We also learned something new about Texas today… It’s not unheard of to see a horse trotting down the road on it’s own for an afternoon stroll. Team Carl had quite the show as a horse walked by the house twice. 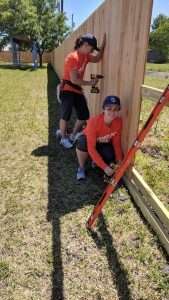 Today, Team Carla worked on a long stretch of fence. This fence creates a border for Cenikor, a local short-term rehab facility and will provide added security and privacy. The ladies worked on installing the cedar pickets which smelled amazing. 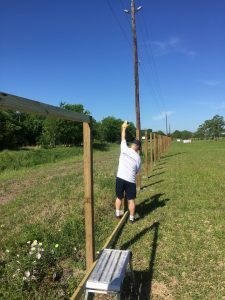 Meanwhile the guys worked on installing more stringers, which prepares the fence for pickets. Team Carl spent the day “detailing the car” so to speak. 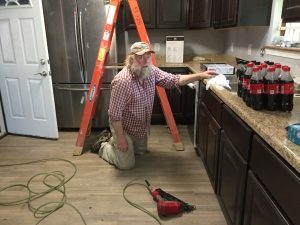 They are wrapping up the final touches on Adrienne’s home and hope to finish by Friday! 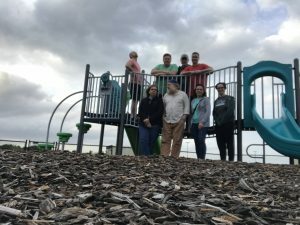 We were lucky to have Adrienne, her husband, John, and their grandson join the Samaritan’s Purse teams for dinner at basecamp and share a bit of their journey since Hurricane Harvey. 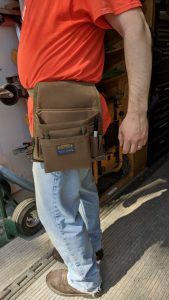 Kevin tried out his tool belt for the first time. The belt contained the only tool he knows how to use, a Sharpie. 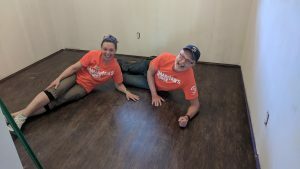 Laura and Gary finished the flooring in a bedroom. They really enjoyed showing off their work before it gets covered with protective cardboard (Ram Board). 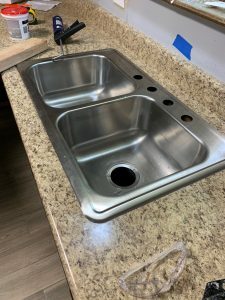 Scott, Heather, Dan, and our Illinois friends also returned to the same house and finished the countertop and installed the sink, which looks beautiful. Dan did what he does best, sawed wood. Occasionally, he was awake. It was beautiful in Pearland, Texas today! Our team was split up so that we could work at two different sites for the week. 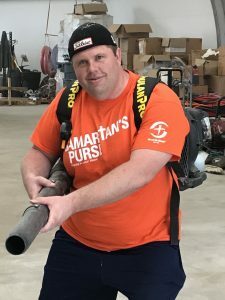 I think I can speak for the whole team when I say that Samaritan’s Purse (SP) is doing amazing work that show’s others the love of Jesus in beautiful ways. Team Carl (we’ve named our mini vans) headed out to Adrienne’s home where they’ll be working for the week. What an amazing woman. She has had so many challenges in life and yet she has hope and she loves others in such generous ways. Dan, Scott, and Heather worked with our SP team lead, Dave, installing counter tops. We were joined on the team by Nancy and Kathy from our neighborhood state of Illinois. 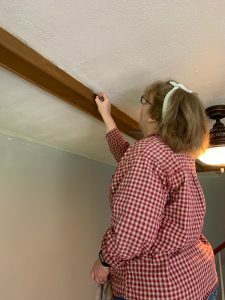 We look forward to continuing with the progress of getting Adrienne’s house ready to move things back into. The other team (Team Carla), consisting of Sarah, Brad, Kevin, Gary, Laura, and our SP team lead, Jerry. We headed to the house of Shawn. 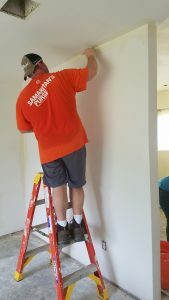 Unfortunately, we didn’t get to meet Shawn today, but were able to work alongside Manuel, a subcontractor installing drywall. Manuel was very intrigued by SP and the work they do. We are looking forward to building a relationship with him as well as Shawn and her family. 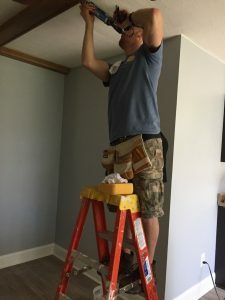 Our team focused on installing flooring and removing the ceiling vents in prep for the next stage of rebuild. Today we finished the final stretch to Pearland! We hit a few thunderstorms and chose to wait out the heaviest part of the rains. For lunch we had Bodacious BBQ where everyone filled up on some delicious ribs, pulled pork and smoked turkey. 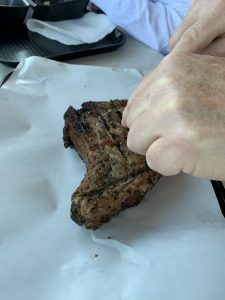 We learned the secret to Dan’s happiness- bbq- as his grin grew with each bite! On arrival to Pearland, we did the mandatory Target run for the forgotten pillow, chapstick, washcloths, and broken bag. Can you guess who forgot what?! We are joined by a few other groups from Colorado and central Illinois. 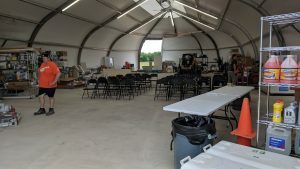 Tomorrow we’ll go through orientation and be on site for our first day of work. We ask for your prayers for safety and that God will use us to show that He is the light. We look forward to sharing stories this week on how God is using us to share the good news. 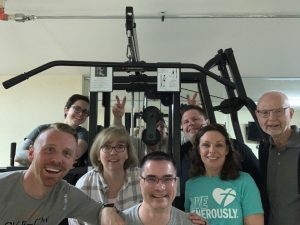 This morning we met at Blackhawk and were joined by one of our Blackhawk Church elders, Tony, and our Impact Director, Susan, as we prayed over our travels and time in Pearland, Texas. Today’s goal was to make it to our hotel and finish the rest of the drive tomorrow. Our road time was overall uneventful, which is a great sign on a long drive! We stopped for food and gas, and kept a great pace. It’s safe to say everyone is eager to get some light dinner and a good night’s sleep. We may even sneak a little workout in while we’re here! Tomorrow we finish our drive and should land at our home base for the week just after dinner. We are thankful for all those praying over our travels and time with Samaritan’s Purse. We’d also love to hear from those following us here on the blog, so please comment. We’ll read over any comments together at breakfast or dinner each day. Kevin is a software engineer at Exact Sciences, which makes a colon cancer screening product. He met his wife Kirsten in Omaha, Nebraska while he was in the U.S. Navy. Let that sink in … it was as far from submarines as he could get, and still be in the Navy! Kevin and Kirsten have four boys ages 17-21 and have been attending Blackhawk since 1999 or so, when it was still at the Whitney Way site. 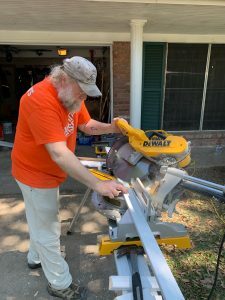 This will be the third disaster relief trip Kevin has been on with Brad, and the first reconstruction gig. It’s great to directly help the families who are really struggling after a major storm. During the week in Texas, he’ll try to cram in a few runs because he’s training for his first-ever half Marathon on Memorial Day weekend! What could possibly go wrong? Hi my name is Brad and I’ve been attending Blackhawk Church for about 13 years. I’ve been married to my wonderful wife Melissa for 13 1/2 years and I have two great energetic boys Caleb (10) and Isaac (7). 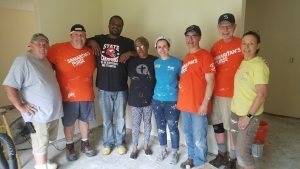 A year after Hurricane Katrina I found my passion for serving others as part of disaster relief teams. I put my passion on hold after Caleb was born. 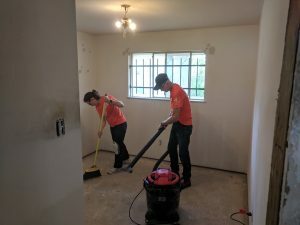 Fortunately in 2015 my whole family supported my vision to start serving on week long trips responding to disasters and rebuilding communities impacted by disasters. That is what brings me to this trip. 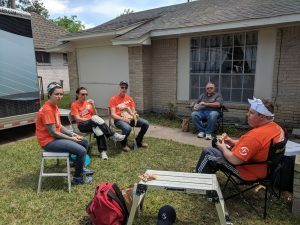 I was fortunate to serve in the community surrounding Pearland Texas about a month after Hurricane Harvey hit and I was also involved with a team that rebuilt a home in October of 2018 in the same area. 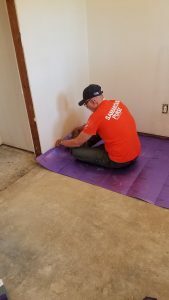 Now I’m looking forward to building new relationships with my team members, other volunteers on site in Pearland and the homeowners that we are serving. When you don’t find me working as a computer programmer or serving you can find me on the golf course trying to get back to the good old days when I knew where the golf ball was going to go when I hit it!! !